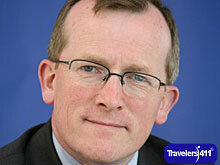 Gerry Keane, Owner and Director, Galway Bay Executive Travel, County Galway, Ireland. Click here for the Galway Bay Executive Travel Directory listing where you'll find links to all interviews with Galway Bay Executive Travel in one place. Click here for more info and links to all interviews featuring Gerry Keane.